The ICEA classic is a festival celebrating Noongar culture which is based around a larger surfing event. There is live music good food, great vibes and skateboarding. Held annually the ICEA Classic has become an iconic event in Western Australia’s calendar. As part of the ICEA classic Freestyle Now hosted a skateboard best trick jam on our pop up skatepark equipment. There was a great turn out of young skaters for the day. Freestyle Now squad member Mitch Harris was in full effect on the judging duties for the best trick with the help of good friend Brendon Cross. It was a great day with lots of young skaters going home with many prizes and sore ankles. Be sure to check out our coming events page for all of the latest events that Freestyle Now has going, you don’t want to miss out on the radness. There were four categories in the best trick jam, best quarter trick, best ramp to ramp trick, best ledge trick and best rail trick. These images show some of the highlights of some of the tricks that went down. More photos can be found on our facebook page here. 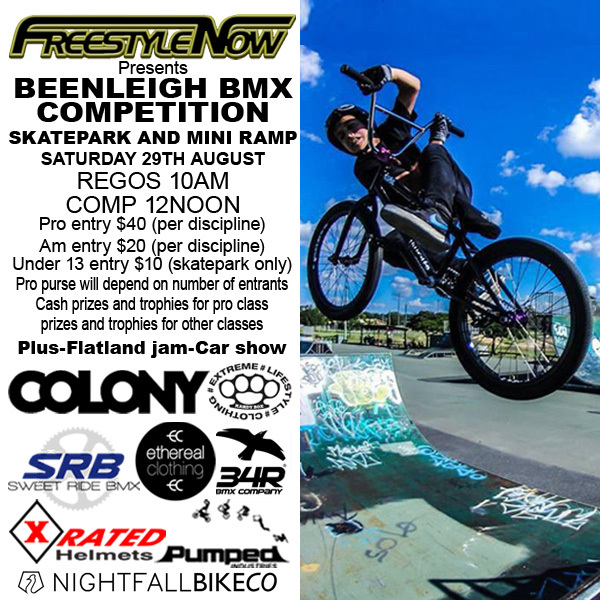 Freestyle Now will hosting the Beenleigh bmx competition at the legendary Beenleigh skatepark in Queensland on the 29th August. Beenleigh skatepark has not seen a bmx competition for a few years so to fill that void Freestyle Now will be inviting bmx riders from around Australia to attend and let the radness flow. Beenleigh skatepark has had a long bmx history with lots of big competitions taking place the during the past 15 years with lots of famous bmx pro riders starting out as little kids riding in the competitions. This competition will also be a forerunner for what is hope to be the Australian bmx skatepark series taking place in 2016. The Beenleigh competition is supported by Colony BMX, Nightfall Bike co, X rated helmets, Pumped Industries, Ethereal Clothing, Sweet ride bmx , Kandy Box clothing and 34R bmx company . The competition will have a pro class and amateur class who can enter into either the skatepark or mini ramp competition. The under 13 class will just be competing on the skatepark. Registrations open at 10am with the competition under way by 12noon. To get all the info either check out the Facebook event page or download the judging criteria and competition format from here. See you and the rest of the Australian bmx scene at Beenleigh. DownUnderGround, the Australian national bmx flatland contest series is now moving into series 7, the contest series has been rolling since 2008. Freestyle Now is proud to have been supporting the contest series since then. Round 1 will take place this Saturday in Sydney at Waverly Park just up the hill from Bondi beach. 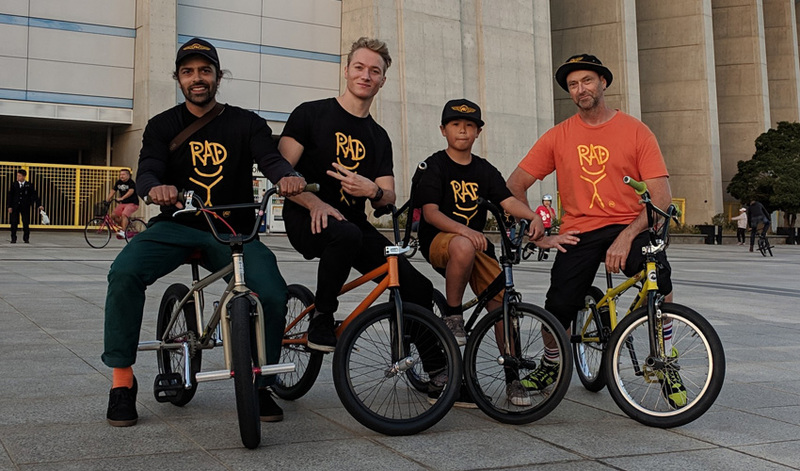 Australia’s top bmx flatland riders will mix it up with international riders and all will converge on a flat piece of land and roll around in circles doing some radical stunts. The contest is open to all riders no matter what bmx they ride. Last year in Melbourne a street rider took out the beginners class for the win. There are three division for competitors to enter, beginners, advanced and pro with great prizes on offer from the contest supporters Freestyle Now, Colony bmx and Primary threads. 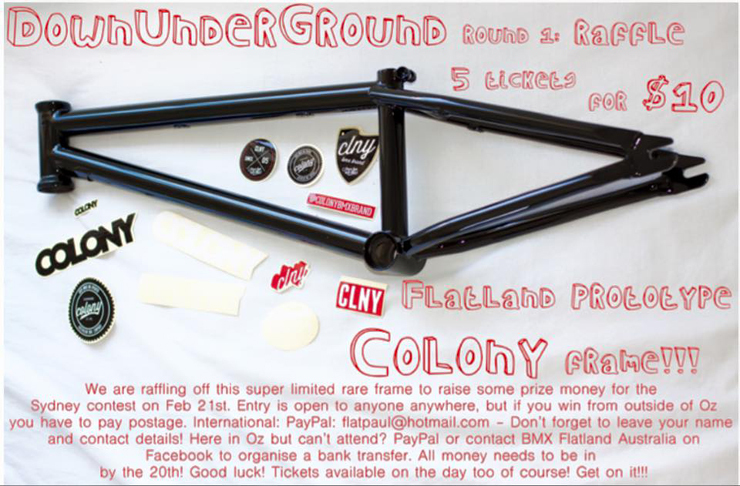 Colony have thrown in a on off prototype flatland to be raffled off on the day. The proceeds from the raffle will go towards a cash prize for the pro class and the winner of the raffle comes away with the frame. Check the flyer below for all info on how to enter, but the essential details are, $10AUD will buy you 5 tickets Entries can be accepted from anywhere in the world, but if you win and you’re outside of Australia then you will need to pay postage on the frame Payment can be made two ways, Paypal – flatpaul@hotmail.com or to arrange bank transfer, contact us directly here. Closing date for entries is 20 February, Tickets will be on offer on the day as well. 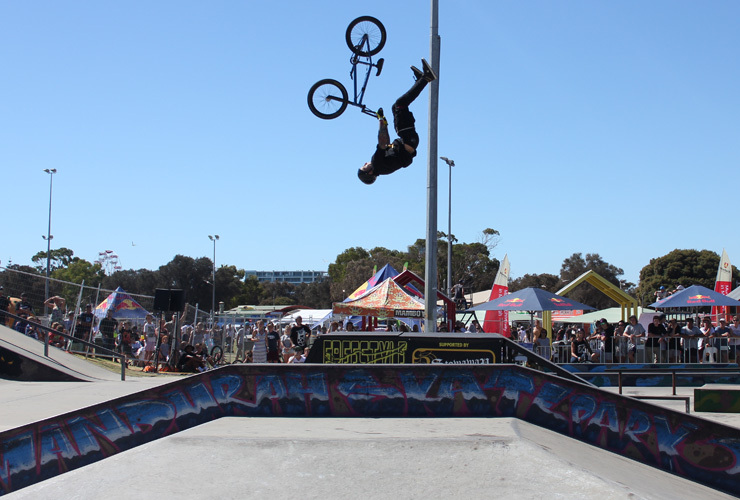 The 2015 Mandurah Action Sports Games will see Australia’s biggest skatepark competition take place at the Mandurah skatepark. Australia’s biggest Action Sports event is only a matter of weeks away. 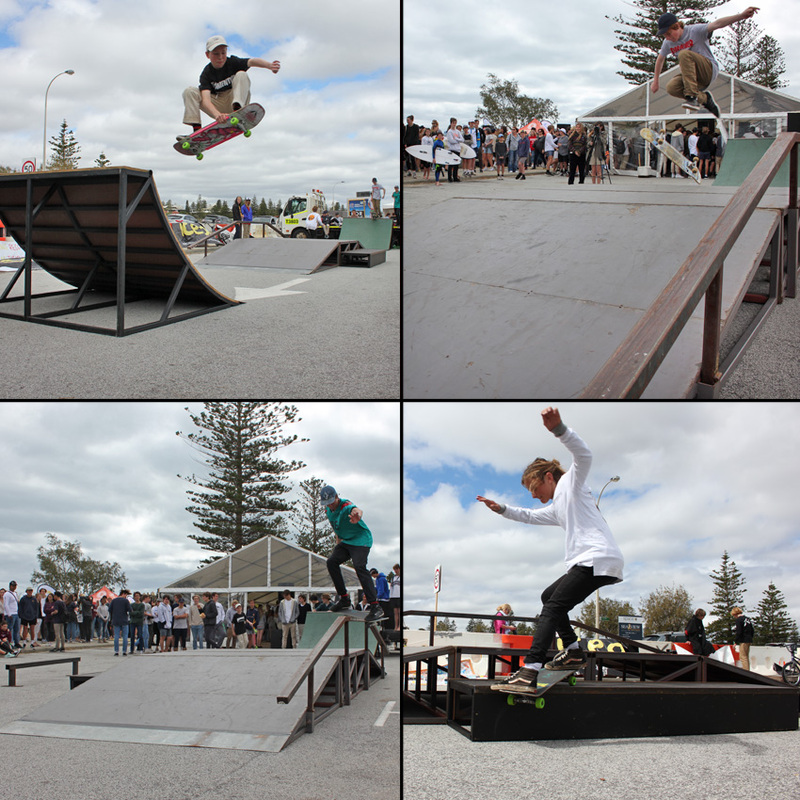 From the 13th – 15th March Mandurah in Western Australia will see some of the nation’s top pro competitors in skateboard, scooter and bmx all throw down some radness to try to win their share of the $20000 prize purse Australia’s largest skatepark competition and prize purse. 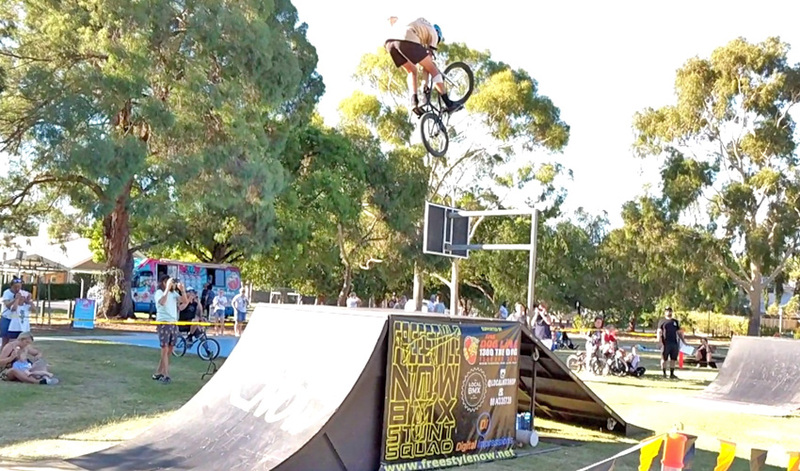 In 2014 Jack Fahey did a back flip superman on his way to 1st place at the Mandurah Action Sports Games BMX park competition. There will be two sides to the competition, the skatepark competition for bmx, skate and scooter and then the halfpipe battle jam for only BMX and skateboarders. This event will showcase some of the finest Scooter, Skateboarding and BMX talent in Australia. 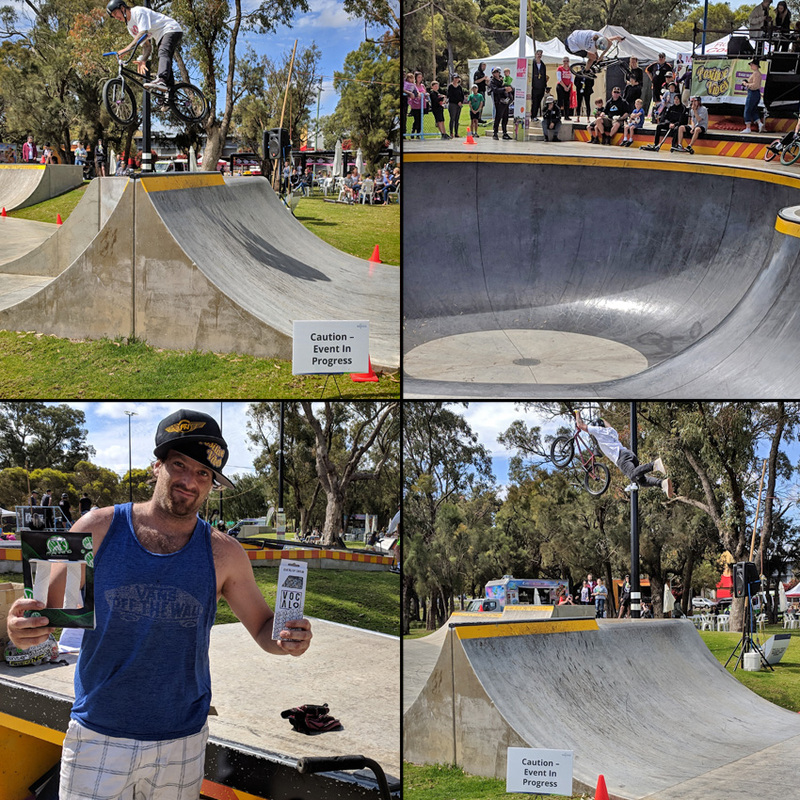 On Friday 13th March the skatepark will come alive when the scooter qualifying rounds start with the top ten riders all earning a place in the Sunday finals and chasing the $3050 prize purse. Saturday morning 14th March the skateboard and bmx qualifying starts. In the bmx competition the top ten riders will all receive a placing into the finals on Sunday and chase their share of the $4250 prize. 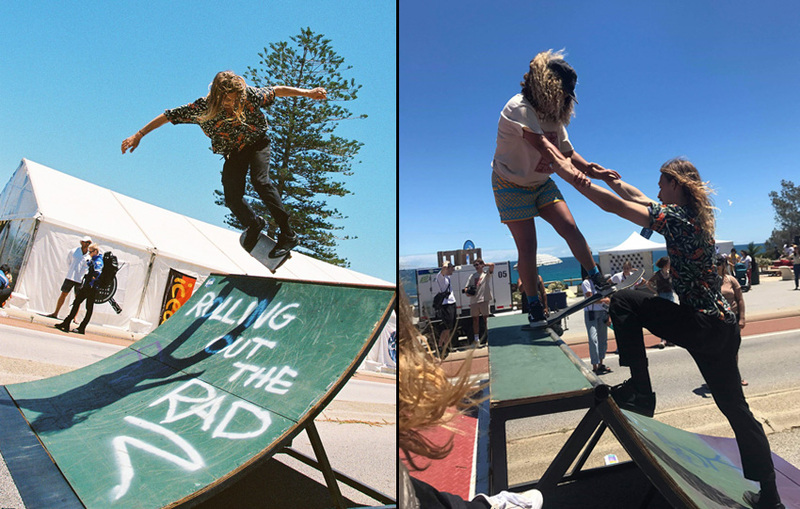 The skateboard qualifying will be in a jam format in which the top 9 will again be ready for the skatepark finals on Sunday 15th March and share in the $4200 prize money. 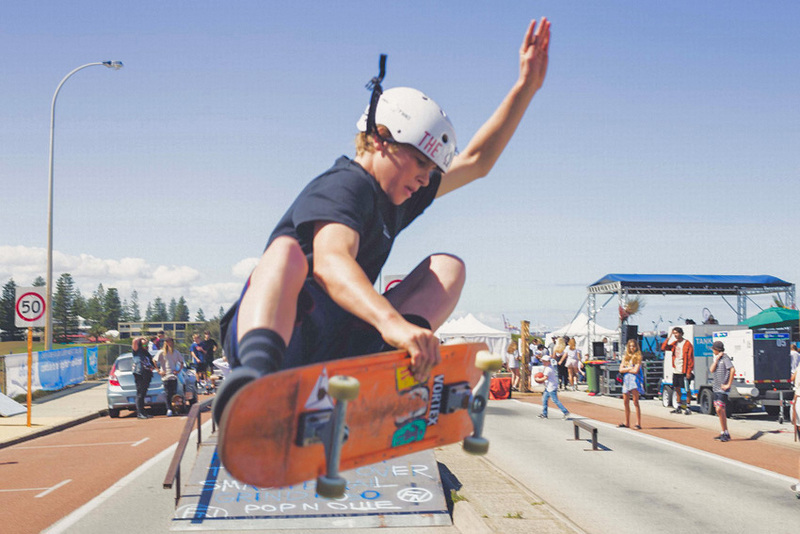 The highlight for Saturday afternoon will be for spectators to witness the total chaos of pro skateboarders and BMXers shredding the mini vert ramp for the halfpipe battle jam. Each of these disciplines has a $4250 purse to share in. The battle jam is where competitors take turn on the halfpipe and throw down what they have got. With four rounds to get through it is going to be a tough to make it through to the end of the jam. The judges decide who is on the top of their game and at the end of each round and competitors are dropped with only the raddest remaining to battle on again until a winner is decided. This is mind blowing nonstop action as the competitors, the announcers and the spectators all play a role in the battle jam. This is something you don’t want to miss, are you going to be there? On Sunday 15th March is finals day. With scooter, bmx and skateboard all rolling it out for the big bucks this day will be the ultimate day to see some of Australia’s top professionals lay it all on the line. This is Australia’s richest skatepark competition a weekend you don’t want to miss. Download here the competition schedule, categories, competition format, judging criteria, prizes money information. The Mandurah Action Sports Games also includes the Waterski & Wakeboard Federation [IWWF] World Cup with more than 150 of the world’s waterskiing and wakeboarding stars from 24 countries working their way through the competition to share in the $300,000 prize pool up for grabs. As well it also coincides with the annual Channel Seven Crab Fest, adding more vibrancy and excitement to the City of Mandurah. 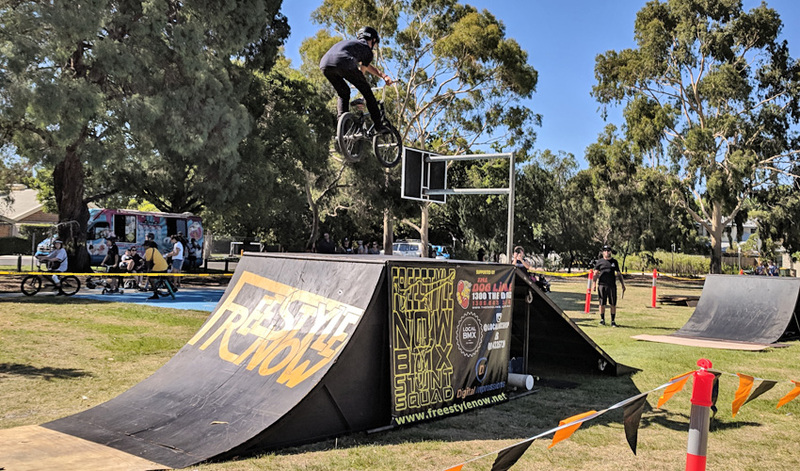 Tourism Western Australia and the Department of Regional Development and Lands are proud to support the Mandurah Action Sports Games through the Royalties for Regions – Regional Events Program, which is administrated by Eventscorp. Check out last year’s competition webposts here, Scooter, Skateboard park, Skateboard halfpipe, Bmx park, Bmx halfpipe and videos below. DownUnderGround the video contest for 2014 so get your cameras ready and start your flatland game on. 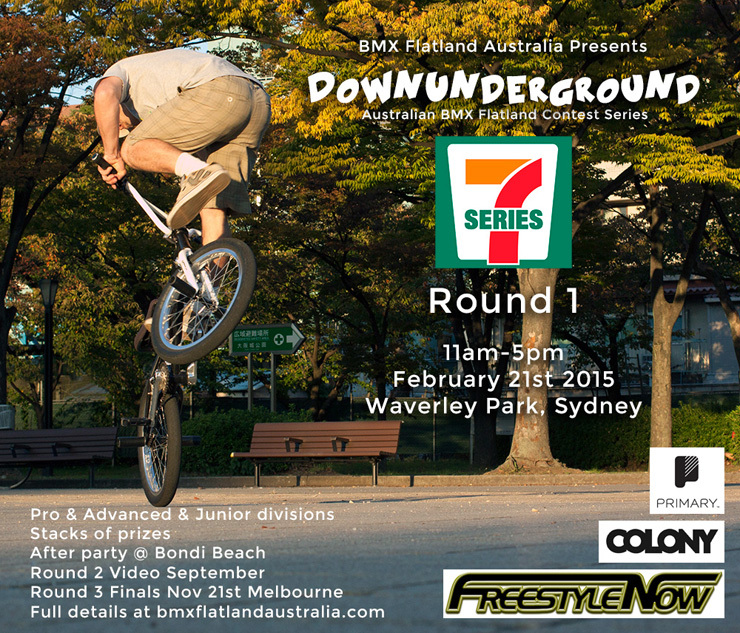 DownUnderGround, the Australian national bmx flatland contest series started in 2008. It has gone through a few changes since then with it being 4 physical contests, but with Australia being such a big country travel to that many contests becomes expensive. 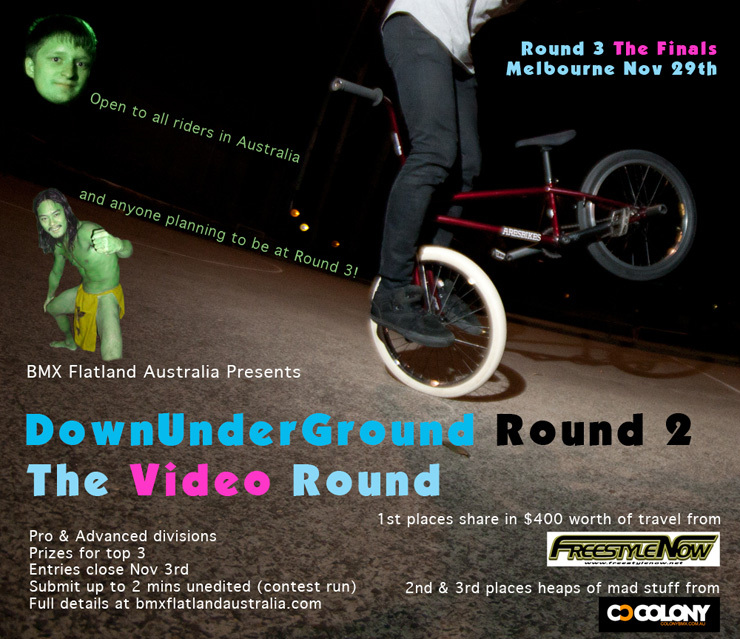 DownUnderGround now has two physical contests, round 1 in Sydney and round 3, the finals in Melbourne and round two is a video contest. The video contest concept is simple, each rider in pro or advanced classes gets to submit one contest video run, between one and two minutes long, as if they were riding at a flatland contest. (It must be unedited and continuous, no video cuts) It can be filmed on any device, quality of video is not important. You don’t need to make the video fancy or have music backing or spend stacks of time editing it. You are judged on the quality of your riding not the quality of the video. The video run gets judged using the same criteria as a normal contest, difficulty, consistency and variety. Points are awarded and these points go towards the year end title. Once you have your video completed and you are happy with your run you will need to submit your video to BMXflatlandAustralia. Once all that is done, click on “submit” and it’s all done – simple as that! Your video will be uploaded to wetransfur. BmxFlatnadAustralia we receive an email notification that your video is uploaded. From there they upload all the contest videos to their YouTube channel. Make sure that the file size is not to large or it will be difficult to submit. Entry’s close 3rd November so all videos will need to be submitted by then to be eligible. On November 4th the videos will all go live on the net through the BMXFlatlandAustralia YouTube channel. The videos will be judged by the judging panel (announced soon) with results posted shortly after that. Get out there and film, nothing is stopping you. Full details on the on the entry information can be found on the format and judges page. Last year squad member Shaun Jarvis took out the first place in the advanced class with this below video entry submission, you can look at the 2013 video contest results here. 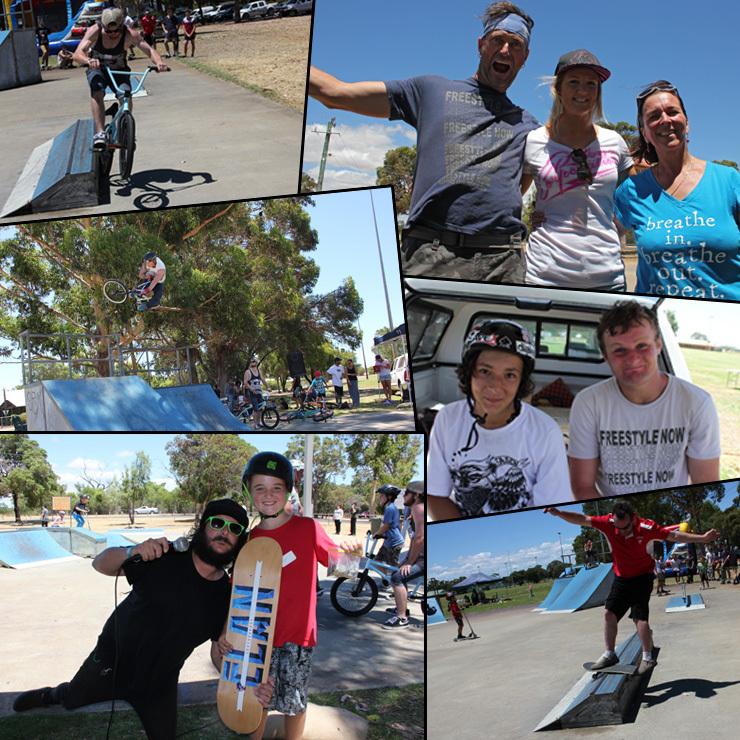 At the beginning of February Freestyle Now was stoked to be involved with the Australind skatepark fundraiser. Australind is a growing community about 150kms south of Perth. They have an old ramp set up skatepark. Its small and not all that great, but any ramps are better than no ramps. A group of local skatepark users led by scooter rider Nigel Heidt and mum Sabine Heidt got a group together and took on the council to ask for an upgrade. With a council meeting and forever growing support the council approved for a new 1.35 million dollar skatepark to be built. The only catch is the community needs to raise $50000 to help. Skateparks are not cheap. So the Australind skatepark fundraiser day was set up to start with this. It was a great day with the community coming out with full support. With massages, food stalls, auctions, donation and an assortment of other means a total of $1750 was raised. This may not seem much but this event is the start and with this will come more community support and donations from business. Go visit the bigger and better Australind skatepark facebook page for all the newest info or to show your support. Once the new park is constructed it will be amazing, with it being a great stop over on the way down south to the plethora of other skateparks in the region. Thank you to all of the people who showed up rode, blasted and supported. Montage from the day top left to right – Local bmxers were reppin hard – Freestyle Now head honcho Shaun Jarvis with Olympian bmx racer Lauren Reynolds and Sabine Heidt – Dylan Schmidt came down to support and help out with some bmx coaching – Nigel Heidt with Hudson Goodchild – Kim Bloodson helped young Ryan get this new skate deck with all of his pocket money in the auction – Skaters were out in force even dude who have been off the skate for 10 years threw down.